Tales from Pollycraft: Challenge, Blog Hop winners, New releases and Freebie!! Challenge, Blog Hop winners, New releases and Freebie!! Firstly HUGE thanks to everyone who took the time out to join in with the blog hop! I hope you enjoyed hopping, and viewing all the gorgeous work from my Design Team, and Guests? Remember to check out the rest of the teams blogs, to see if you were lucky enough to win anything!! The digis are now available in the shop!! 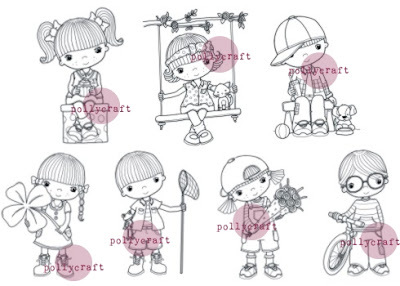 Thats 7 digi stamps for the average price of just 1 rubber stamp!! The moon has been crackle glazed, but its quite subtle, as I don't think I added enough... Can't get it to show on a piccy! The swirls were stamped using an accessory stamp that came with a whimsy carousel horse stamp. Then I just added a few red heart buttons as finishing touches!! The sentiment worked in my head, but i'm not sure if it takes too much thinking about...? I thought it was quite sweet! If you take her, give me some feedback!! I hate to be a pain, and spit my dummy, but I used to add a new freebie EVERY week... and some weeks over 1000 people took it...Only a tiny percent of those people said thanks! I've lost followers since I stopped doing weekly freebies, and have even had people complain!! can you believe that? I even used to get people TELL me what they would like to see as the next freebie!! lol!! you have to laugh really! anyway....I understand that now you are taken away from the blog to place an order for the freebie, its easy to forget to come back here, but sometimes a better way to say thanks is to use the freebie, and share what you've created!!! its not a rant, just a little thought... put yourself in my shoes! okay.... nuff said...sorry about that.... lol!!!! Enjoy Flo, Grab a bargain... and get creating!! Lovely freebie, I have taken her and hope to make a card this week as soon as I do I will let you know x Thank you for your kindness I think people forget what is involved and want everything for free! Thank you, this freebie is so cuute ! I know exactly where you are coming from as I've put freebies on my blog too and hardly anyone leaves a comment! So thanks for this one, off to check it out now! Oh Paula, some Paula can be so rude can't they. How can anyone have the cheek to complain that you are not giving away a weekly freebie. Your digis are so gorgeous and hardly break the bank to buy them. Followers come and go but the true followers stay. I have had them leave once I have drawn some candy. You know who your friends are, I say. Thanks so much for this freebi. I love Flo and the new digis are fab, love them all. Paula can't believe that sooooooooo many people didn't say thanks. I know I always left a message and I did notice that you didn't get that many comments but wow a thousand that is dreadful. Thank you so much for this cutie. Haven't bagged her yet as didn't want to forget to leave a comment here. You rant away all you like hun. You know what they say, the more you give the more they want. I love your freebies and have quite a few of your digi's because I love them too. Thank you again for this new little cutie and as soon as I use her I will be back to let you know. Ignore the moaning minnies and take heart from the reliable number of followers that you do have. Thanks so much Paula! 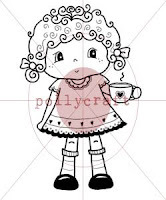 She is such a cutie and I love the cup... perfect for a coffee addict like me. Hope to play with her soon! I love the new set! I also think this freebie is adorable. I will link back when I finish her. Thank you so much for sharing! Hi Paula, thank you for the freebie and for your constant generosity. I can't believe what some people complain about!! Thanks for the new freebie! She's cute! :D I put freebies on my blog too but I'm not sure how many take it and how many take it and leave comments! :D I think this is a common problem around the web...it takes a simple 60 seconds to say "thanks"! Thanks for this freebie image, she's a cutie! Thank you very much! She's adorable! My way to remember is to comment before I get the freebie...then I'm won't ever forget. So, THANK YOU!! Thanks for the fabulous freebies. Thanks for sharing your gorgeous talent and Thanks for creating new digis for us to buy and use...It really contributes to the fun we have with papercrafting. THANKS!! Thanks so much! People can be annoying. My husband's company supplies SOME soda and juice and water for people. People were actually complaining that they weren't carrying their particular favs - unbelievable, right? So it doesn't surprise me, but does sadden me. THanks, again, and LOVE your images - and they are so reasonable! I will hop on over to the shop for the freebie later but i wanted to say thank you for this cutie!!! Thank you so much Paula :-) Flo is indeed very cute. Hoping to use the image on a forum b'day card. Thank you so much Paula. Flo is indeed very cute. I am hoping to use the image on a birthday card. Thanks for the freebie- sorry I have left comments on the form in the shop the last few times rather than on your blog when I have downloaded the freebie. I really do appreciate your kindness is giving these freebies- they are such good quality and I just love your images. It made me angry to think people are complaining that you are not offering them every week- what a cheek! I've been a follower and customer for ages, so have NO intention of leaving, even if you NEVER give another freebie :)....and this one is particularly cute! Thank you! She is so so cute! Thank you so much for the freebie! Thanks so much for the cute image- I really appreciate it and look forward to making a card with it! I think that it is very generous of you to share theese lovely images! I will give credit to you and link to your blog when I´ve used it! Tank you very, very much! She is just as sweet and adorable as can be. Thank you so much!!!! Thank you for letting us have the sweet little teatime girlie! Thanks for sharing! People can be so selfish sometimes, you are so generous. I always follow your blog and very much appreciate the freebies and the challenges when I have a chance to get creating. THANK YOU!!! Been a fan for a long time now and love your images. I have something for you on my blog, and hope you like it! Thanks for the cute little girl! I do enjoy your images. They're so sweet and whimsical! Hello Paula! You are totally right and we are a rotten bunch! I do love your freebie - she is uber sweet and all those who downloaded her must think so too! I have downloaded her - thank you honey! I am waiting for your next challenge to see if I can use her for that! Thank you very much for this super-cute freebie!! thanks for this freebie paula. i'm new to using digistamps so i'm really excited about having a play with this one. she's so cute and you are very talented. Thanks for the freebie, made a card with her last night!!! !